These were absolutely DELICIOUS!!! I used a slice of provolone and cheddar for each sandwich and grilled these on my George Foreman. I made some garlic butter using 1/4 cup of butter, 1 tsp granulated garlic, 1 tsp onion powder, 1 tbls parmesan cheese, dash of salt and pepper and 1 tsp oregano. I mixed this together and spread it over the sandwiches before I grilled them. They came out perfect! I will definitley be making these again. Spread butter on the "outside" pieces of bread that will touch the griddle when cooking. Spread marinara sauce on the inside pieces of the sandwich bread. 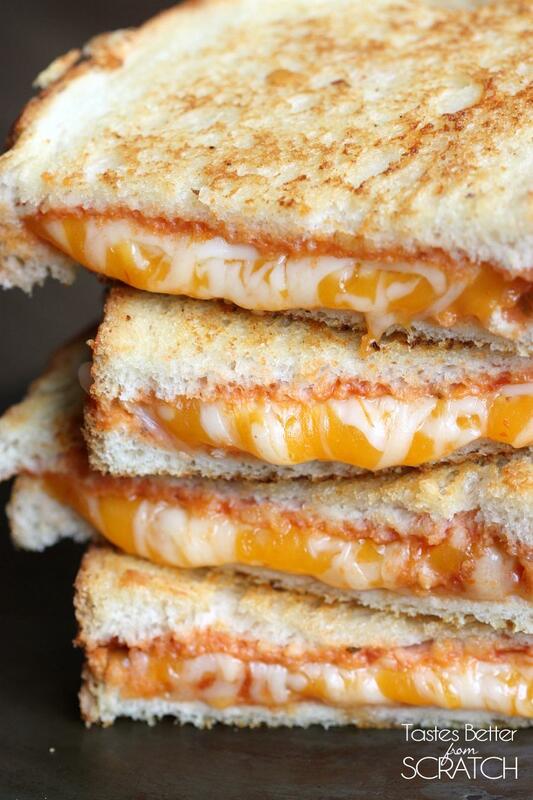 Layer mozzarella and cheddar cheese on top of the marinara sauce. Top with fresh basil, if using. Place bread slices together to make a sandwich. Place sandwich on hot griddle or skillet and cook until cheese is melted and bread is golden brown and toasted. Serve immediately.